You know how in some video games, like Minecraft, characters have blocky heads? And, in turn, block hairdos? 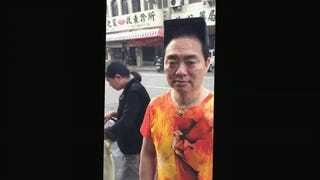 Well, one man in Taiwan has that kind of coiffure...for real. Meet Mr. Wu, a 54 year-old medical laboratory scientist at National Taiwan University Hospital with a truly remarkable hairstyle. Just look at it! Do it! As reported by ET Today (via ShanghaiIst), Mr. Wu is single and hopes his hair makes him look younger—like he's in his 20s or 30s—in order to attract women. The 'do requires two tubs of gel and two hours to complete. But the good thing is that Mr. Wu only needs to comb his hair every two weeks. The "good" thing.